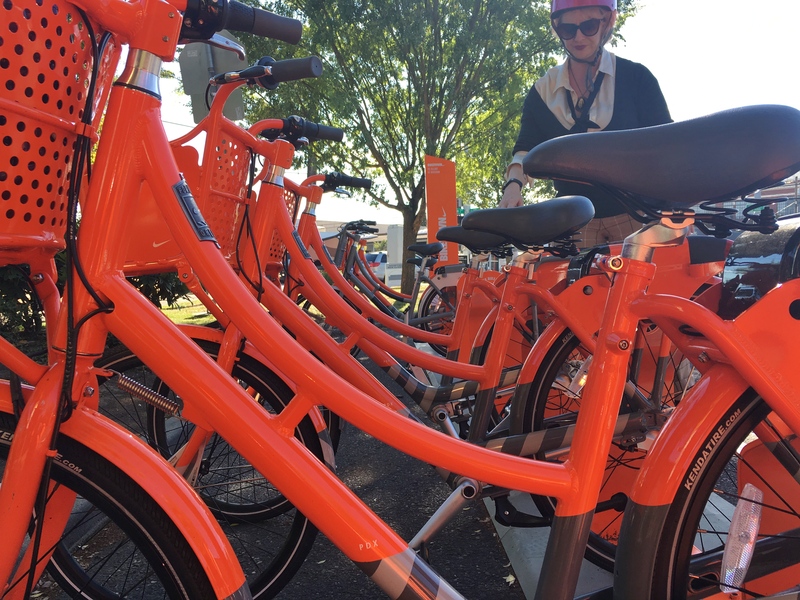 Orange bikes have invaded Portland, Oregon! 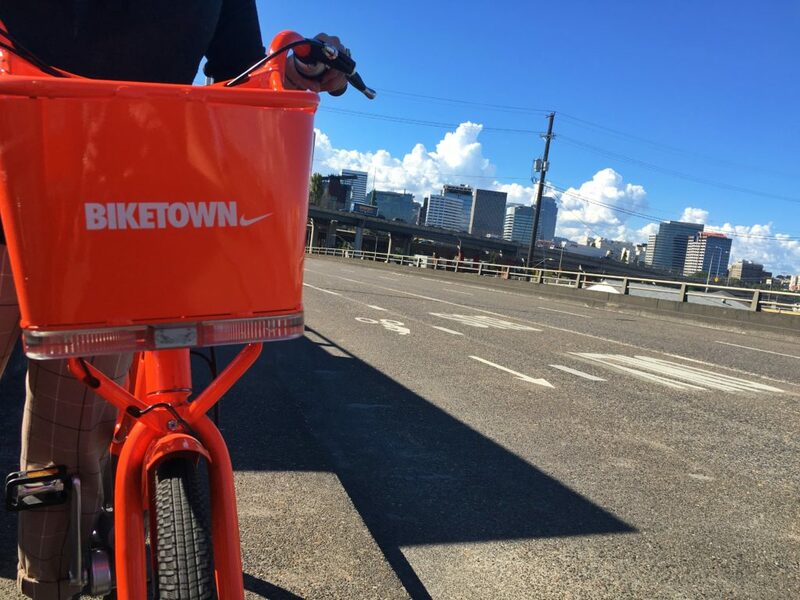 It seems like Biketown is everywhere: all over downtown and the Pearl District, plus scattered around the inner sections of North, Northeast and Southeast Portland. I’ve have been curious about how the system works, so on a beautiful sunny day two weeks ago, we tried it out. I had two objectives (besides having a nice afternoon with my best friend): One, to see how these could factor into a visitors vacation plans. Two: Determine if this is a good to my own “transportation cocktail” as I like to call it. My “cocktail” currently includes my car, Trimet, Car2Go and very occasionally Lyft. 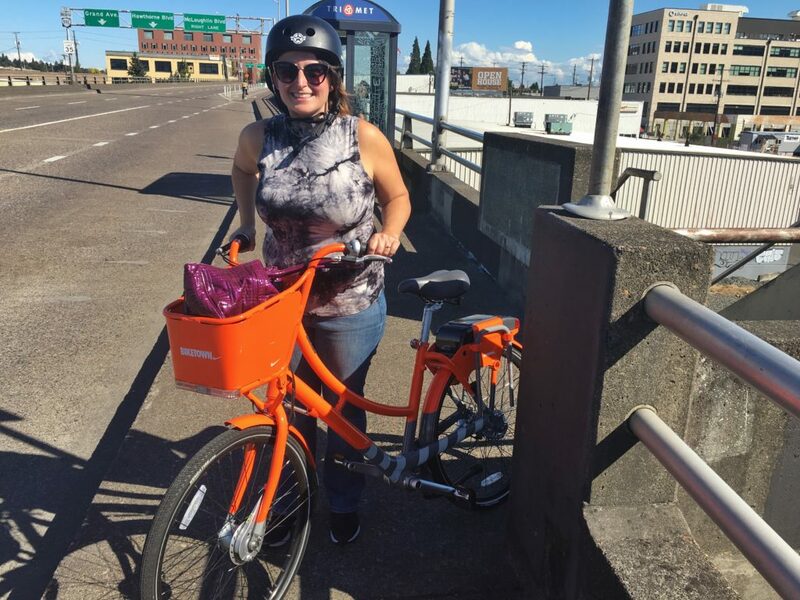 Will I add Biketown into the mix too? 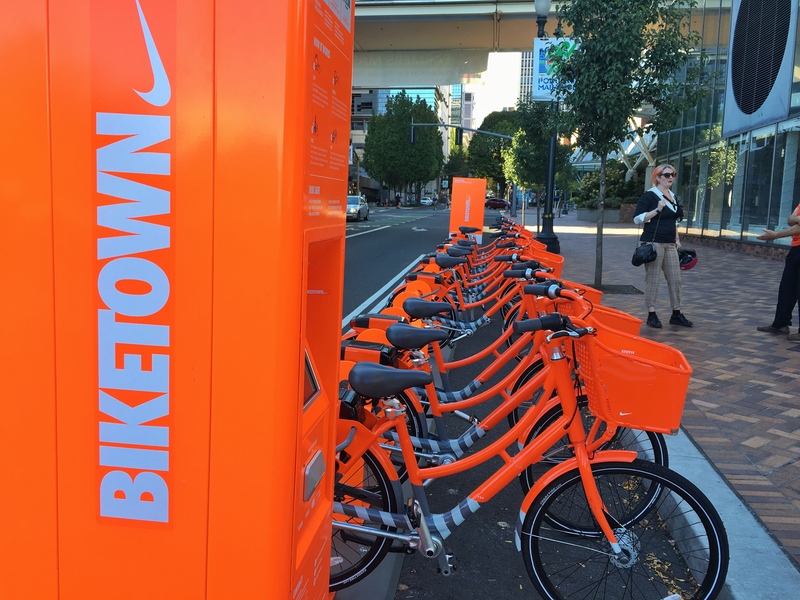 First, here is the basics of how Biketown is supposed to work. Create a membership. You can do this on the website, through the app on your phone, or at one of the kiosks at the the bike hubs (Note: not all hubs have kiosks). Ride. Make sure you place the U-Lock in the holster on the bike. Lock it back up. To end your ride, just lock it back up at any hub, or on a public rack for a small fee. Did the system work well for us? Yes and no. We had a few problems getting started. I set up an account ahead of time and pre-paid enough money for 4 single trips ($10). When we arrived at the hub near the Salmon Street Fountain, we learned that I can’t pay for a friend. She had to have her own account , but the kiosk there was broken. So she had to download the app, set up an account and enter her credit card info while we stood there on the street. It was a long process and by the time we were down, both of us were really annoyed. But we started riding, and had a great time. We headed across the Hawthorne Bridge to 12th & Hawthorne where we parked our bikes. Then we headed into Ladd’s Addition for iced coffees at Palio Espresso and Dessert House. (Really cool cafe!) . When we were done we walked over to a hub next to Double Dragon on Division & SE 12th. We checked out two more bikes then rode across Tilikum Crossing and back to Salmon Street fountain. In the end, it was a good experience, despite our rocky start. One note on the bikes. I found them to be very comfortable as bikes go. The seats were soft and wide, but it wasn’t really a fast bike. They are heavy with all that equipment, so big hills would be a challenge. They also don’t offer any helmet rentals. I understand that the logistics would be very complicated on their part but at the same time, it seems highly unlikely that tourists or even locals hopping on for a quick trip would have one along as we did. Is this a good option for tourists? Yes. The $12 day pass seems like a great idea for anyone who wants the freedom to explore. Once you register, they are really easy to use and there are a TON of hubs that make it convenient for nearly any location a visitor would want to go. The ability to switch bikes is also a big plus so you don’t have to lug the same one around with you all day. Will I add it into my transportation mix? Personally, probably not. If I worked downtown, maybe, but for now, I’m not likely to use it on a regular basis. The helmet issue is a hangup for me, plus it’s not offered in my neighborhood (I live too far out). But for the right person, this might be an amazing way to travel. A monthly pass is only $12 (must sign up for the whole year). Car2Go and Trimet can not compete with that price. In the end, I’m really glad I tried it. The registration was frustrating, and I found the website a bit misleading, but I did have a great time using the service. I hope more people start checking them out. I plan to use it again in the future, but until my life circumstances change (kiddo grows up, we move, new jobs) it will remain a novelty. A fun way to get around when hanging out with friends.